Engineers and Scientists at NASA are creating a lightweight telescope to conduct investigations for CubeSat. The unique feature of this telescope is a carbon nanotube mirror embedded in epoxy resin, which may make it the first of its kind. The team involved in this development is headed by Theodor Kostiuk who is a scientist at NASA’s Goddard Space Flight Center that is located in Greenbelt, Maryland. The major objective of the team’s effort is to create a cost-effective and reproducible telescope, small enough to fit inside a CubeSat, which would measure four inches on one side. NASA is increasingly relying on CubeSat and other small satellites for its technology demonstration, scientific research, educational investigations and explorations. Usage of small satellites reduces the cost of various NASA missions such as earth observations; basic space and earth science; exploration of planetary space and design of pioneer scientific instruments such as autonomous movement potentials; state-of-art laser communications and communications between satellites. In addition, the use of miniature satellites provides hands-on, real-life research experience to students in various stages of satellite design, working and exploitation in rideshare launch opportunities funded by NASA. The scientist added that the idea may not have a scientific output similar to that of a large-sized, ground-based telescope or a flag-style mission, however, it can be used to send a constellation of CubeSats with similar features or used for first order scientific explorations. 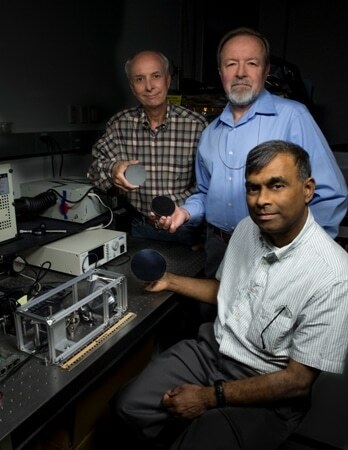 The team, funded by Goddard’s Internal Research and Development program, has used three commercially bought small-sized spectrometers which are sensitive to near-infrared, visible and ultraviolet wavelength bands to set up a lab optical bench. Fiber optic cables are used to connect spectrometers to a focused beam of the carbon-nanotube mirror, three inches in diameter. The overall design of the telescope is tested at the optical bench. This new mirror can become an essential part of space telescopes, which are relatively inexpensive and used for various CubeSat scientific explorations. Aluminum or glass is used to make most telescope mirrors, but carbon nanotubes placed on epoxy resin have been used to make this mirror. Carbon nanotubes of sub-micron size that are cylindrical in shape have unique electrical properties and extraordinary power, in addition to being effective heat conductors. These properties make the material a significant element in various material science fields such as electronics, nanotechnology and optics, among others. As a result, many structural materials have them as additives. No one has been able to make a mirror using a carbon-nanotube resin. This is a unique technology currently available only at Goddard. The technology is too new to fly in space, and first must go through the various levels of technological advancement. But this is what my Goddard colleagues (Kostiuk, Tilak Hewagama, and John Kolasinski) are trying to accomplish through the CubeSat program. Peter Chen, Goddard Contractor and President of Lightweight Telescopes, Inc.
Hewagama states that using carbon-nanotube optic in CubeSat telescopes has a lot of advantages. The scientist got in touch with Chen after he learnt that Chen’s firm has been given a NASA Small Business Innovative Research program to bring further developments to the area of mirror technology. Carbon-nanotube mirrors are not just easily reproducible, lightweight and very stable, they need not be polished, which is an expensive and time-consuming activity, on a regular basis to achieve proper shape and smoothness, said science project collaborator and engineer Kolasinski. The mirror is produced by a simple process of pouring carbon nanotubes and epoxy into a mold or mandrel of the required optical prescription and heating it till the epoxy is hard and cured. The hardened mirror is given a coating of a reflective, silicon dioxide and aluminum, material. After making a specific mandrel or mold, many tens of identical low-mass, highly uniform replicas can be produced at low cost. Complete telescope assemblies can be made this way, which is the team’s main interest. For the CubeSat program, this capability will enable many spacecraft to be equipped with identical optics and different detectors for a variety of experiments. They also can be flown in swarms and constellations. Chen states that a CubeSat telescope can be used in optics technology. He also believes that the concept would work in larger telescopes that have several mirror segments. Examples of telescopes with multiple mirror segments include James Webb Space Telescope, which has a main mirror of 21-feet that consists of 18 hexagonal shaped mirrors, and the twin telescopes, housed in the Keck Observatory in Mauna Kea, Hawaii, each of which is 32-feet in size and consists of 36 segments. As most of the mirrors in the segments of these telescopes are identical, they are made using the same mold. This method is both cost- and time-saving as this does not require different mirrors of the same focal length and shape to be made. Carbon nanotubes can also be converted to ‘smart optics.’ Keck telescopes, for instance, have external actuators for all the segments, to deform the mirrors according to the desired telescopic orientations, so as to get one ideal focus. Carbon nanotube mirrors can, however, be equipped with internal actuators at the time of fabrication. By administering electric fields to the resin mix before it is cured, carbon-nanotube networks and chains can be formed. When power is supplied to the mirrors by technicians, after the curing stage, the shape of the optical plane can be changed. This technique has been tested and proven in the laboratory. This technology can potentially enable very large-area technically active optics in space. Applications address everything from astronomy and Earth observing to deep-space communications.